Containment Liners may seem like a broad term which could describe any liner that happens to contain any type of liquid. In its most simplistic terms containment liners are just that. 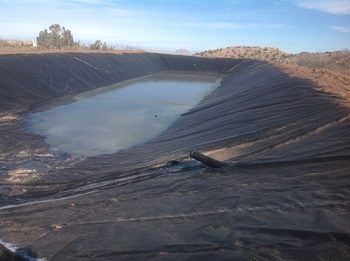 In the Geomembrane Liner industry though, it is most often used to describe Critical Containment. Examples of containment liner applications that are common throughout the industry are applications such as oil and gas, as well as chemicals, or other hazardous waste. Containment Liners can be used to describe frac pad liners, pit liners, transformer pad, or well-pad containment. Unique chemicals that need to do be contained by a liner are often described as containment liners as well. Tank liners that contain caustic chemicals or waste can also commonly be described as containment liners. Pond & lake liners that “contain” fresh water normally not described as containment liners. Western Environmental Liner works with a wide variety of materials to ensure that whatever liquid needs to be contained they have the right product for you at the most affordable price. Reinforced Polyethylene, RPP, & Xr5, are examples of a few liner materials that are used in containment industries but are quite different in both price, longevity, and what they can contain. Containment Liners can be broken down in two separate categories as well based on if the application is for primary containment (the liner is the first line of defense) or Secondary containment (used as a guarantee of containment if the primary containment fails). Whatever description used to describe your unique containment needs, Western Environmental Liner is there to lend a helping hand. Contact Western Environmental Liner today to help you with your Containment Liner needs.